Peggy D. Warren, 75, of Vandalia, MO passed away at 2:10 a.m. Tuesday, July 10, 2018, at Boone Hospital Center in Columbia, MO. Funeral services will be held 1:00 p.m. Saturday, July 14, 2018, at Waters Funeral Home in Vandalia. Burial will be in the Vandalia Cemetery. Visitation will be held 11:00 a.m. until the time of the service Saturday at Waters Funeral Home. The family is being served by Waters Funeral Home of Vandalia, MO. Peggy was born January 8, 1943, in St. Charles, Missouri the daughter of Bessie Cropp-Holman and (Harry Edwards), but was raised lovingly by Clarence Holman Sr.
Peggy was united in matrimony to Joseph Benjamin Salmon May 12, 1959, and to this union, two children were born Eric Salmon and Ramona L. Salmon Whayne. Survivors include her son and daughter Eric Salmon of Morgantown, West Virginia and Ramona L. Whayne Springfield, MO. 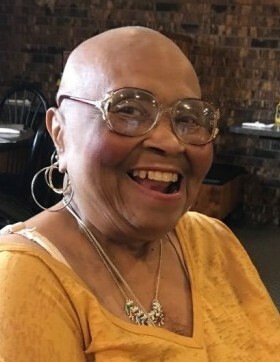 Her grandchildren – Megan Salmon of Paris, France, Christopher Salmon of New Orleans, LA, Benjamin Salmon of New Orleans, LA and Erica Salmon of Seattle, WA. Her brothers - Donald Boyd (Cree) of Stafford, TX, Clarence Holman Jr. (Trudy) of St. Peters, MO, Fred Holman (Mary) of Sparks, Nevada. Her daughter-in-law Julie Salmon and her son-in-law James. Peggy’s sister-in-law Cynthia Holman and many uncles and aunts including but not limited to Raymond Cropp Jr. (Maggie), Charles Shelton (Jeannie), Lewis Shelton, and Ronald Lee Shelton (Yvonne) plus a host of nieces, nephews, and cousins who were like her sisters. Peggy was preceded in death by her parents, two brothers Roderick S. Holman and Mike Edwards, her beautiful aunts Jacqueline Bryant, Stella Wray and Florine Dixon, special Uncle Wilford Moore. Peggy attended grade school at Lincoln School and Vandalia High in Vandalia, she was employed at Bobbie Brooks, Vandalia MO, Kamp Togs, Clarksville, MO, Brown Shoe Company, Pittsfield, Illinois and she was lastly employed by MO Division of Child Services as a child care provider. Peggy was a member of the Second Christian Church of Vandalia MO. Some of her enjoyments were reading, cooking, collecting salt & peper shakers and recipes. Her biggest love was the fellowship with her family and friends. Pallbearers will be William Wheeler, Jamie Wheeler, Art Wiser, Louis Connors, Chico Wray, Larry Wheeler. Memorial contributions may be made to the Second Christian Church of Vandalia or Dialysis Clinic Inc. of Mexico, MO, in care of Waters Funeral Home.